With the recent release (and subsequent disappearance) of The Tuxedo in theaters, the era in which Jackie Chan can successfully open a film based on his own merits may well be fading. Chan, who is approaching his fiftieth birthday, is still a treat to watch, regardless of the film, the saving grace of many of his pictures. Shaolin Wooden Men may be the perfect example of this, as it proves Chan to be a star with abundant energy and talent who can turn a truly wasteful motion picture into something more tolerable. In Shaolin Wooden Men, Chan plays Little Mute, a Shaolin disciple whose training is, to say the least, rigorous. As Little Mute completes his training at the monastery, he befriends a nun as well as a prisoner, each of whom help him on his path to becoming a monk. When Little Mute passes his tests and has concluded his training, his last task is to deliver a letter for the prisoner, though the ramifications are deadly. Upon delivery of this letter, Little Mute learns that the prisoner is not what he seems and may be responsible for the death of Little Mute's father, amongst other horrors. With this knowledge, Little Mute begins to extract revenge, even if it means killing the prisoner, a man who taught him everything he knows about fighting. Whether or not you will enjoy Shaolin Wooden Men will largely depend upon your willingness to suspend any sense of criticism and simply enjoy the ride. The film is largely an excuse to cram together as many fight sequences as possible in place of a coherent plot. While the lack of a streamlined, or even an understandable, plot is easily excused given the genre, I was hoping for at least some sort of character development. Instead Shaolin Wooden Men seems to introduce characters for the sole purpose of offering more opportunities for Chan to show his amazing fighting style. In the lead role, Chan is instantly likeable, a feat that is all the more impressive when you consider that he has only a single line of dialogue throughout the entire film. His ability to craft exciting and inventive fight sequences is what gives Shaolin Wooden Men the ability to rise above the skeleton script. His climactic battle with numerous opponents is thrilling to watch and shows why Chan gained such a large following, long before his first American film. Image Transfer Review: The 1.78:1 anamorphic widescreen transfer for Shaolin Wooden Men is among the truly worstfrom a major studio that I believe I have ever seen. The print used is of poor quality; often the image suffers from a large number of scratches, as well as a constant line that runs on the right of the screen at times . Sharpness and detail? Forget it. The image is almost always blurry to the point where it becomes hard to focus anywhere on the screen. Audio Transfer Review: The Dolby Surround mix is offered in both Mandarin and English versions. The original Mandarin language track is overly hollow sounding; the dialogue and music seemed to be tinny and at times difficult to understand. Extras Review: Trailers for the infinitely superior Panic Room, the blockbuster Spider-Man, and the admittedly fun The One are each offered in anamorphic widescreen with Dolby Digital 5.1 sound. 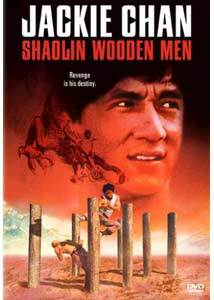 In part, I enjoyed Shaolin Wooden Men; unfortunately, I was not thrilled enough to offer even a mild recommendation other than to fans of Chan.